This luxurious Maserati Quattroporte was the company's most successful saloon yet - and it has a Ferrari engine. A Ferrari engine, stand-out looks and a trident badge on the grille: the Maserati Quattroporte that ran from 2003-2013 was the most successful version of the Italian firm’s four-door saloon yet. The fifth generation sold over ten times the number of its predecessor. As glamorous a sports saloon as you could buy, the Quattroporte’s a very specialist purchase new, and requires commitment (and a healthy bank balance) to run used. But if you’re prepared to be different, it’s not without many rewards, not least the sound of that V8 petrol engine. 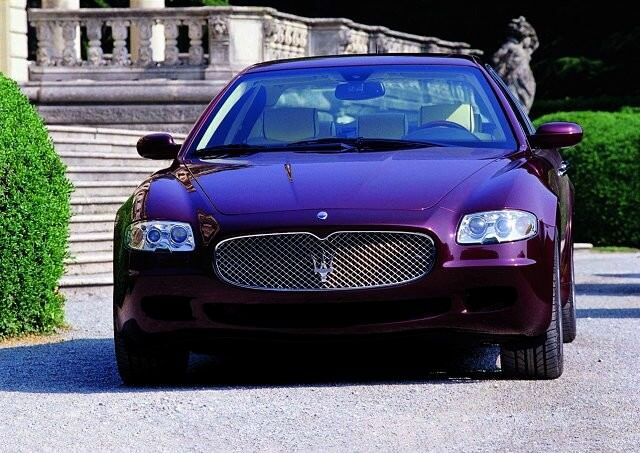 Over the ten years Maserati built the fifth-generation Quattroporte it fiddled endlessly with its specification. Barely a year went by without some revision to the model line-up, though the basic engine in most was a 400hp 4.2-litre V8, built at Ferrari’s engine plant and derived from the same unit that powered the F430 sports car. That alone is reason enough to buy a Quattroporte, as the sound of that naturally-aspirated V8 at high revs is utterly glorious - the rest of the driving experience isn’t all quite as sensational. When the Quattroporte was introduced in 2003 it was offered with DuoSelect, an electrically actuated manual transmission, which, like the engine, is Ferrari-derived. Its shifts are clumsy by the standards of modern twin-clutch automatics. They improve with speed, but enjoyable as the Quattroporte is when wrung out, it’s not often you get the opportunity to do so. The basic model range consists of the Quattroporte DuoSelect, the Automatica (a proper automatic arriving in 2007, just for a year) and the Sport GT. The Quattroporte saw its biggest revision in 2008 when it was facelifted. Along with some visual tweaks came the choice of a bigger 4.7-litre V8, offered alongside the base Quattroporte’s 4.2-litre engine. Power for the larger capacity V8 grew to 430hp in the Quattroporte S, while the Sport GT S got 10hp more. Regardless of model, all Quattroportes managed to reach 100km/h in less than 5.6 seconds and achieved a top speed of or in excess of 270km/h. All come expansively equipped, as you’d expect for a car that cost so much to start with, though kit like the satnav was a bit old hat when new, and severely dates the interior today. The space inside is decent, if not as generous as other sports saloons, though you’ll forgive the big Maserati a lot when you hear that V8 at revs. The ride, thanks to Skyhook suspension, does a decent job of being comfortable and sporting, with a bias to the latter. We’d definitely go for any Quattroporte with the conventional automatic over that DuoSelect semi-auto. A post-facelift version (2008) would also be on our wish list, the styling revisions making it look a bit sharper. Tempting as the 4.7-litre V8 is, it’s unlikely you’ll find the 4.2 lacking, and they’re more common in the classifieds, too.